I produced my wine two days ago and used specialy designed labels. It was a bit of a suspense for me because the labels show torture devices used by Spanish Inquisiton in 16th Century. Today we shot a comercial for my wine which is called The Spanish Blood. I play a vampire who shows up in the young girl bedroom and proceeds to bite and drink her blood. We end up in the Church after midnight everyday , fool around and make music and perform. This part of Spain is very intense and has a great vibe. hello friends in your situations I in mine in Barrytown New York. I am just encountering a shipment of work from Germany delivered to Jess and Josh in Upper Red Hook. I am of two minds now, astonished to see so much of what I did in paper and cloth from more than a year ago, and then, what shall I do with all these objects and panels so I don’t have it insinuating on my new works in the space or in my mind. Oh my. I want to send it all to Venice but Emily can’t take it right now. I have trouble storing work away. I want to show these things to us. Maybe the thing to do is open my Barrytown shop to all of you to visit! I’ll make an art show and I’ll make a soup and we can sit in the back yard and look at the upended tree. It’s only 2 hours from New York city. 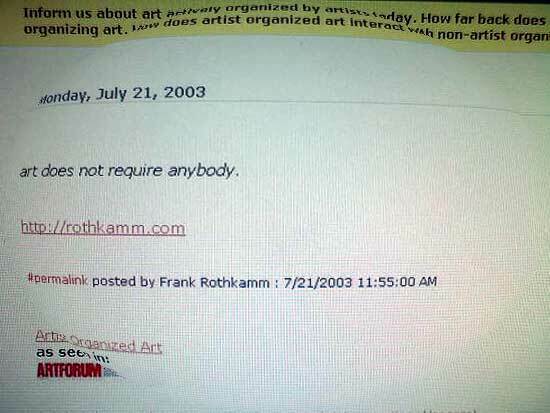 Contact me on the Artist Organized Art common document. Write and visit. It’s all here. the other thing is the Fluxus in Nice, south France for early September. I can take a few things in my bag but we will do alot of performances. Just be sure to show us what you are doing and don’t leave it stored forever in a barn somewhere. There is always more where that came from. When I get back from Nice I’ll tell you what happened. I have enjoyed reading what people are doing here alot. Clearly Josh has a great idea here. also, read Walter Benjamin’s Arcades. What a good timing with the opening of this website! We, Paco Simon and I, are just practising artist organized art in the Monastery of Veruela, Zaragoza, Spain: we are organizing Cambio Constante IV, a yearly visual arts event in Zaragoza, Spain. We have invited 15 artists this year, among them Suzy Sureck, who already mentioned the event in her contribution. Also are here Maciej Toporowicz, Hartmut Boehm, Monika Brandmaier, Yaacov Hefetz, Sharif Waked, Christopher Snee, Jon Tarry, Susken Rosenthal, Benoit Maubrey, Sally Gutierrez, Alberto Andres, and now I have to go quick and get from the train station Josip Bace and Bozo Jurjevic. (…That is what artist organized art really means…) So I will continue tomorrow to tell about the event here and insert some images. The Artist as organizer; as outpost to the only way of pure observation of the moment. This is an energy that has fueled me and many others into action. I began work inputing and organizing all the written texts by and of Lucio Pozzi in 1988 at 142 Greene Street in Soho after meeting him at the School of Visual Arts. Lucio was my earliest mentor as an artist activist, organizer and contemporary renaissance thinker. This is where New Observations was made. The brain child of Lucio and a small group of friends who got together in the early 80s and started making a magazine. It’s premise was to invite a different guest editor for each issue. Eventually artists submitted proposals for issues as well. In it’s 20 year+ run as an artist organized contemporary art journal it published the voices of thousands of artists nationally and internationally and was a place where “artists speak for themselves.” I eventually became the Art Director and General Editor, when Ciri Johnson left around 1990 and Lucio turned the magazine over to the able hands of Diane Karp. Lucio remained very much involved in the publication to the end. I think the last issue came out in the Fall of 2001. I would love to see both Lucio Pozzi and Diane Karp contribute to this site. The guesture of invitation is a key element of the artist organizer. As with the events of Construction in Process, an artist would invite one other artist to participate. This site and medium is very well suited to the moment and a welcome outlet and container for the artist’s voice here and now. Thank you for inviting me to participate in this exciting venue. Artjacking from dealers seems to be a good idea though.. The recent trend in building spectacular museums and galleries feels like an end to a certain era. It has a nostalgic feel of the end of empire. It reminds me about days when they built churches. They are all empty now. Why would you care for container so much when it is the emptiness inside that holds whatever we want? art does not require anybody.